Mindstorms Mayhem, a FIRST LEGO League robotics team consisting of home schoolers from area towns, won the FLL International tournament in Atlanta, Ga., last weekend. Team members include, back row from left, Benjamin Streeter of Bedford, Brian Jennings of Merrimack, Benjamin Krupkin of Milford, Nathan Gray of Milford, and Victoria Umenhofer of Wilton; front from left, Melissa Gray of Milford, Jacob Krupkin of Milford, David Schunemann of Hollis, Nathan Streeter of Bedford, Daniel Umenhofer of Wilton. WILTON -- Two Wilton home-schoolers were part of the team that won the Director's Award at the FIRST LEGO League International Tournament in Atlanta, Ga., last week. 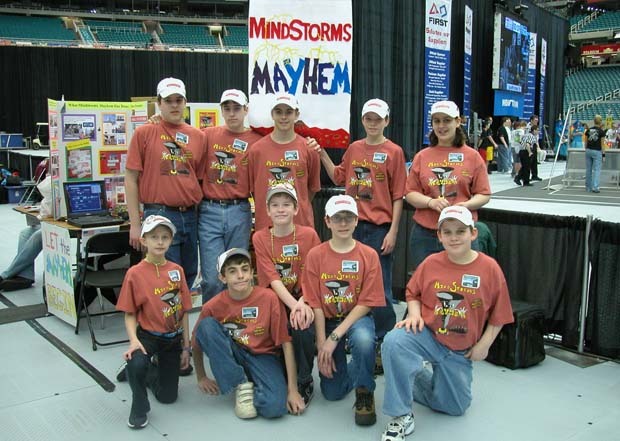 The team, which is called Mindstorms Mayhem, competed against 47 champions from 39 states and five other nations to win the award, which is given to the msot well-rounded team excelling in all judging categories. The team consists of 10 home schooled students from Wilton, Milford, Merrimack, Hollis and Bedford. As winners of the Director's Award at the state tournament in December, Mindstorms Mayhem went on to represent New Hampshire at the international competition, held in conjunction with the FIRST Robotics Competition Championship, in Atlanta, April 15-17. The youngest of 11 children, Wilton home schoolers Victoria Umenhofer, 13, and her brother Dan, 10, were excited about Mindstorms Mayhem's win at the tournament. Being only their first year as a part of the team the experience has been a good one said their mother and teacher, Jeanne Umenhofer. "It's been a wonderful experience for them," said Umenhofer. "The coaches are extremely knowledgeable and kind, and they've been especially patient with the rookies." During the three-day International Invitational, the team's robot competed against other robots to complete nine "Mission Mars" challenges in two-and-a-half minutes. The missions were designed to simulate those obstacles faced by NASA scientists and engineers in the Mars rover missions. The team was also judged in technical areas, research and teamwork and presented their research on geothermal power as a channel-surfing skit. In five minutes, the judges saw a game show, a news interview, a science talk show, a rap song, and an interview with a robot designer. After presenting their research skit and robot during the first day of competition, Umenhofer said the team got called back the next day to compete against six other teams in front of all the judges. Along with the Director's Award, team Mindstorms Mayhem also won the Special Assignment award. The assignment grouped teams from across the country into alliances of four teams each. They were given a special assignment to complete over the two-day period. Mindstorms Mayhem's alliance teams were from Alaska, Mississippi, and North Carolina. Umenhofer said the teams had to work together on the special assignment using all four robots from each team. For every extra robot the team used, she said they got bonus points. "It was really fun to meet other teams and hear the different accents," said Victoria Umenhofer. According to Charlotte Gray, whose husband Bill Gray is one of two coaches on the team, the students researched multiple topics before choosing to focus on geothermal energy as a power source for future human habitation modules on Mars. As part of their research, the students even contacted a scientist in the United Kingdom via e-mail, who sent them a research paper on geothermal energy. Since winning in December, Gray said, the students continued to meet twice a week in the Grays' basement, working on their public speaking techniques and tweaking the technical aspects of their robot. In addition to researching and building, the students raised approximately $10,000 through fund raising and company donations to pay for the team's trip down to Atlanta. Gray said the students sent out 99 letters to businesses and received 35 responses from companies like BAE Systems, Landry's Lawn Mowing, Monadnock Mountain Spring Water, Burbak Companies, and Shaw's Supermarkets who said they were willing to help out with the cost. The FIRST LEGO League is an international program with the goal of giving children, ages 9-14, the opportunity to discover the rewards of science and technology. Each year, the program works to hone problem-solving skills and teamwork as the teams design, build, program and operate autonomous robots to meet the mission challenge.